Very stressful month in our tropical garden, this February! Not that our plants aren’t doing fine. It is just that we are fighting a losing battle with the disgusting rats that visit our garden. Previous years, their unwelcome entries were infrequent but got worser since the last year and is becoming even more rampant of late, like storming in every day and at any time, much to our extreme distaste and frustration! We just hate these detestable vermin that are playing a cat and mouse game with us and seem to be winning! Yuck! Everywhere and anywhere, especially along the perimeter of our front yard and garden beds, they mark their favorite spots with urine and droppings that stink up the whole yard! Can you imagine gardening in such an unhealthy environment, breathing the foul stench that even permeates into our living hall whenever we open the door to exit? And, seeing them running around obtrusively without a care in the world really makes our blood boil, being fully aware that we are forced to daily clean up the mess they leave behind which is mostly taken care of by John. Besides, my beloved better-half is also the one who sets the rat traps, only to be disappointed most times without a catch but bait taken and outsmart by a rat. That’s not the end, should there be one trapped successfully, he is further tasked to rid of it and clean up the spot it dirtied. A never-ending job where the traps too have to be cleaned thoroughly, disinfected and sunned, to be reused all over again. He is so very fed up with the whole affair. Therefore, I don’t blame him for suggesting time and again in exasperation that we get rid of all our garden plants/pots at the front yard where the hateful rodents take shelter. Or at least reduce drastically the number of potted plants, he frequently implores. What a difficult choice to make, especially when we love all our plants! Anyway, I have better start doing the latter (i.e. 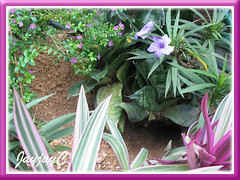 reduce our potted plants) lest he surrenders all his rat tasks to me! Eeeek…I’m scared stiff of these little rascals, give me the shivers! And, they are relatively large! Over the years, John had tried many ways to reduce or end the rat infestation in our front yard but to no avail. Various kinds of rat trap were used besides poison pellets and naphthalene balls, all in vain! Hopefully, the plan to eventually cut down the number of our garden plants will work otherwise we would have sacrificed our plants for nothing. They come into our front yard from all sides, the monsoon drains just outside our home and across the road, as well as from a large dumpster less than 20m away containing garbage from the dwellers of the low-cost apartments where the rats converged to feast and party. They have become even bolder this month, burrowing into the garden beds and also the larger containers, rummaging our plants. Though greatly annoyed, we were actually amazed that so small an animal can dig such a huge and deep hole. Judging from the mound of soil amassed, probably a pair were at work on-site. And, these vermin will dig again and again relentlessly at the same spot or elsewhere nearby each time my hubby seals it back with earth. We wonder why? Potential breeding? I’m wondering whether those populating our neighborhood are the common Brown Rats, as featured at Wikipedia. More about these mammals here. 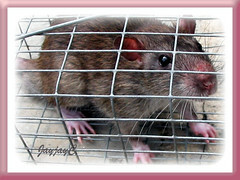 Read about steps taken to rid our garden of rats. Are the garden rats gone forever?